The University has unveiled an ambitious five-year Sustainability Plan—the first of its kind for Harvard—detailing a strategy to build on existing greenhouse gas reduction goals and setting priorities in five core areas: energy and emissions, campus operations, nature and ecosystems, health and well-being, and culture and learning. Goal: University-wide resource reduction goals with a specific target within a set timeframe. Standard: Operational standards to facilitate alignment across the University, ensuring that a consistent approach is being implemented. Standards are designed to allow flexibility for how they are implemented by individual schools and administrative departments. Commitment: A statement of commitment or recommendation for future research in areas where there was not enough information to set a specific numeric goal or standard. Universities have in recent years been concerned about their impact on climate change. (In 2008, for example, Stanford developed the Stanford Energy System Innovations program, which is intended to cut carbon emissions in half and reduce water use by 15 percent by 2015.) Harvard officials said they had looked to other universities as well as corporations when developing the new plan. Heather Henriksen, director of the Harvard Office for Sustainability, said stakeholder engagement was key to creating the plan—senior administrators, facilities and operations teams, student leaders, and faculty advisers met in committees to develop policies that can be tailored to the cultures of their individual schools and departments. The plan, Henriksen said, should be seen as a “living document” that will evolve and change over time; there will be a formal process, she explained in an interview, to review and set new goals every five years. reduce those emissions 30 percent from a 2006 baseline by 2016 (taking new campus growth into account as well). 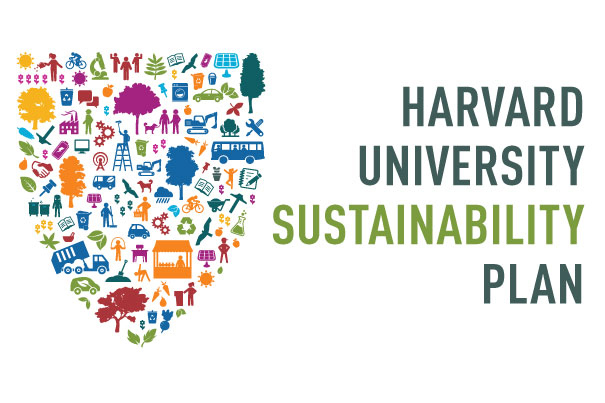 In 2012, Faust announced the release of Harvard’s first University-wide Sustainability Impact Report—an interactive website filled with data on the University’s efforts to make the campus environmentally friendly. Specifically, the new five-year plan outlines the same goal to reduce greenhouse gas emissions outlined in 2008, and to implement net present-value positive-energy conservation measures in Harvard buildings as part of a five-year capital planning process. Another aim is to conduct a University-wide, on-site renewable-energy study to inform the goal setting of the 2016 Greenhouse Gas Reduction Goal Review Task Force. In terms of Campus Operations, the report maintains University-wide compliance with Harvard’s Green Building Standards, and intends to reduce waste per capita 50 percent by 2020, with the goal of becoming a zero-waste campus. Transportation goals include developing a University-wide plan by 2016 for reducing campus transportation fleet and shuttle emissions, as well as achieving a gold-level Bicycle Friendly University status from the League of American Bicyclists. Focusing on health and well-being was an important part of the planning process, Henriksen said, and the plan aims to identify and track high-risk chemicals in targeted buildings, and encourage participation in wellness programs through the Healthy Harvard Initiative. In its focus on culture and learning, the plan details efforts to translate research and teaching into practice on Harvard’s campuses by “facilitating collaborations to pilot and launch innovative solutions to sustainability challenges.” There is also an effort to increase alumni engagement in sustainability efforts by 2016. Nature and ecosystems goals include developing a University-wide Climate Preparedness and Campus Resilience Plan by 2020, maintaining at least 75 percent of the University’s landscaped areas with an organic landscaping program, and choosing plant species that are likely to be robust in the face of future environmental change.